Production or manufacturing can be simply defined as value addition processes by which raw materials of low utility and value due to its inadequate material properties and poor or irregular size, shape and finish are converted into high utility and valued products with definite dimensions, forms and finish imparting some functional ability. In this article we will see ” What is Machining ” , Introduction to machining ,Definition Of Machining , Purpose of Machining , Principle of Machining . Most of the engineering components such as gears, bearings, clutches, tools, screws and nuts etc. need dimensional and form accuracy and good surface finish for serving their purposes. Preforming like casting, forging etc. generally cannot provide the desired accuracy and finish. For that such preformed parts, called blanks, need semi-finishing and finishing and it is done by machining and grinding. Grinding is also basically a machining process. Machining is an essential process of finishing by which jobs are produced to the desired dimensions and surface finish by gradually removing the excess material from the preformed blank in the form of chips with the help of cutting tool(s) moved past the work surface(s). A metal rod of irregular shape, size and surface is converted into a finished rod of desired dimension and surface by machining by proper relative motions of the tool-work pair. 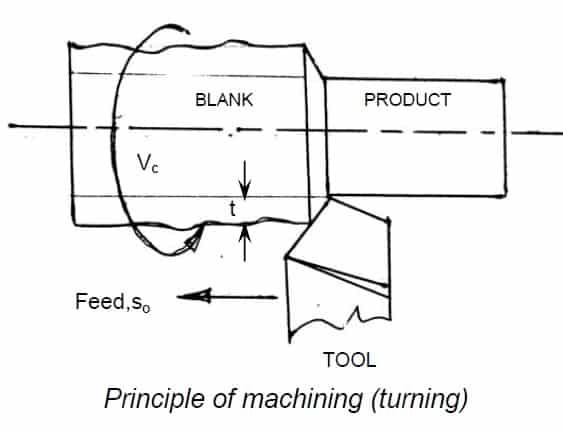 The essential basic requirements for machining work are schematically illustrated in Fig. The blank and the cutting tool are properly mounted (in fixtures) and moved in a powerful device called machine tool enabling gradual removal of layer of material from the work surface resulting in its desired dimensions and surface finish. Additionally some environment called cutting fluid is generally used to ease machining by cooling and lubrication. Machine Tools basically produce geometrical surfaces like flat, cylindrical or any contour on the preformed blanks by machining work with the help of cutting tools. • provide power to the tool-work pair for the machining action. • control of the machining parameters, i.e., speed, feed and depth of cut. A machine tool is a non-portable power operated and reasonably valued device or system of devices in which energy is expended to produce jobs of desired size, shape and surface finish by removing excess material from the preformed blanks in the form of chips with the help of cutting tools moved past the work surface(s). There are many kinds of machining operations, each of which is capable of generating a certain part geometry and surface texture. In turning, a cutting tool with a single cutting edge is used to remove material from a rotating workpiece to generate a cylindrical shape. The primary motion is provided by rotating the workpiece, and the feed motion is achieved by moving the cutting tool slowly in a direction parallel to the axis of rotation of the workpiece. Drilling is used to create a round hole. It is accomplished by a rotating tool that typically has two or four helical cutting edges. The tool is fed in a direction parallel to its axis of rotation into the workpiece to form the round hole.